A woven circular bamboo ikebana basket with tall overhead handle. The basket itself is of double gourd shape, the loosely woven sides are bound together by bands of platted bamboo. The star-form base is engraved to the centre with the four-character signature of Chikuunsai in gilt. The basket is contained within the original wood tomobako, which is inscribed on the outside Suehiro ami hanakago (flared-shaped, woven basket for flowers) and on the inside Tekisuikyo Chikuunsai-zo (made by Chikuunsai, at Tekisuikyo studio), and with two seals. Tanabe Chikuunsai II (1910 – 2000) was a member of the Japan Art Academy (Nihon Geijutsin). He is a scion of the famous Tanabe family of basket makers and studied under his father, Chikuunsai I (1877 – 1937). 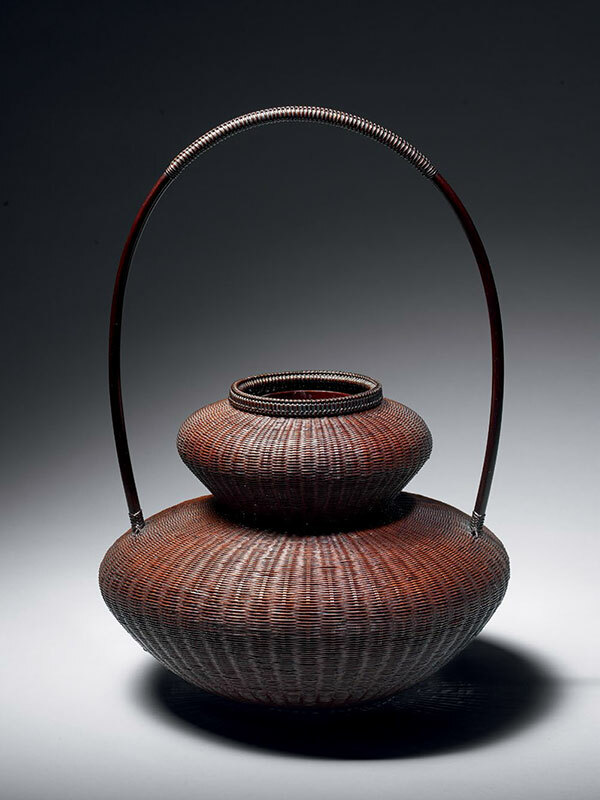 One of his descendants, Chikuunsai IV, who was born in 1973, continues the celebrated family tradition of basket making until the present day. Chikuunsai II, whose given name was Toshio, exhibited in the Nitten exhibitions many times and was one of the judges. He inherited his title in the year of his father’s death in 1937. Tekisuikyo was the house/studio in which Chikuunsai II lived until around 1965.